Most pets do not tolerate spicy seasonings very well or large quantities of food. Avoid giving pets a sampling of everything on the human menu. On the morning of the holiday, exercise the dog to try to wear it out before guests arrive. Make sure to dispose of turkey bones where the pet cannot get to it. These bones will splinter when chewed. Bones can get caught in a pet’s esophagus or intestinal track and could be life threatening. Rancid food is full of bacteria and can make a pet very sick, so make sure garbage is not accessible to the pet. Turkey stuffing may contain onions, garlic, or raisins—all toxic to dogs, so resist the urge to feed your dog human food. 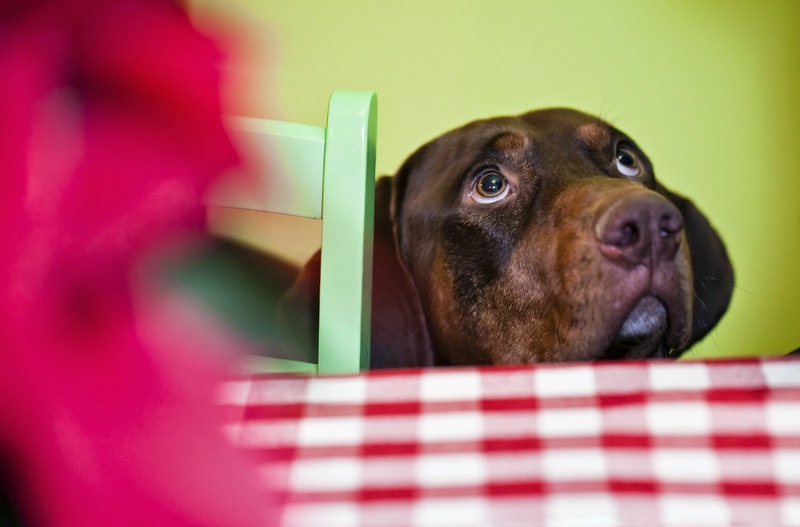 Remind guests not to offer table scraps or appetizers to the dog. If the family pet is skittish around people, noises, sudden movement then containing the dog away from the stimulation is recommended. Offer special chew toys during the time people are buzzing around. An open door or open garage may be an invitation for your pet to bolt. Keep your pet contained while guests are coming or going. Make sure your pet has ID and license on a collar just in case it bolts out an open door.